When I fly, I enjoy matching landmarks below with maps shown on video screens in the plane. I traced the meandering Yukon River on the treeless tundra in Alaska and the jungle-fringed coast of Papua New Guinea. The bad land of Western US is quite dramatic with its multi-color landscape, and I am always happy to see San Francisco after a tiring 13-hour flight from Hong Kong. One scene left me with an indelible sense of emptiness. On a flight from Hong Kong to Europe, I passed over the denuded hills and silt-laden rivers of mountainous Southwestern China. When the plane reached the Tibetan Plateau, it did not attempt to fly over the massive mountains. The plane turned north and traced the ancient Silk Route between the snow-capped mountains to the west and the featureless Gobi Desert to the east. The vast void of the Gobi (which means the Wall of Spears) was overwhelming. While common sense dictated that there was a horizon, it was not discernable to me as the brown land gradually merged into the light brown sky. For miles, I could not see a single feature on the land or a single cloud in the sky. I felt like I was staring at a blank piece of brown paper. 30 minutes later, a different vista appeared through the window. Fluffy clouds hovered over their own shadows on the desert floor, and the clouds stretched to the invisible horizon. I knew I was flying 6 miles above the ground, and I estimated the clouds to be five miles long and two miles above ground. Yet, the clouds looked like small puffs of white cotton hanging above a piece of brown sandpaper in a diorama. I felt as if I could reach out and pluck them like cotton candy. This surrealistic scene was strangely like a Salvador Dali painting. Although I was sitting in a crowded plane, the vastness of the land below left me with an eerie feeling of utter loneliness. 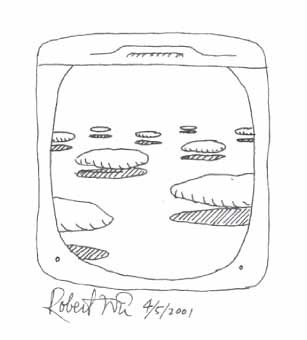 Posted by Robert Wu on Thursday, April 5, 2001, at 11:58 pm. Filed under Uncategorized. Follow any responses to this post with its comments RSS feed. You can post a comment, but trackbacks are closed.